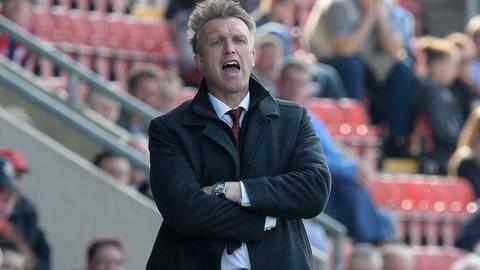 Crewe Alexandra manager Steve Davis says he is planning to make changes after seeing his side suffer their sixth successive defeat. Tuesday night's 3-0 Johnstone's Paint Trophy first round exit to Rochdale was the second three-goal home defeat inflicted on the Alex by the Lancashire side at Gresty Road inside a fortnight. "It's time to act I think," said Davis. "It's got to be some out and some in. "It's now about winning matches. If we don't, then we'll get relegated." The Crewe supporters, who followed the Alex to Wembley just 17 months ago when Davis's men won the trophy, voted with their feet on Tuesday night - as a crowd of just 1,529 turned up. And those that did turn up ended the night very unhappy, making their feelings known. "It's difficult," Davis told BBC Radio Stoke. "The crowd are disgruntled and rightly so. But we've got to do something. "The players are finding it hard to be big and brave enough. But they've got to be men. "They've got to stand up to it and get used to it. They went through it last season and they've got to go through it again." The Alex, who made just five signings this summer before the August transfer window closed on Monday, sit bottom of League One without a point going into the home derby date with local rivals Port Vale on Saturday week. They have lost seven of their eight matches they have played, in all competitions, their only victory having come at relegated Barnsley in the League Cup. Davis's men are without a game this weekend, as a result of having too many players away on international commitments.